The fans pick: 1. Bad Reputation. Do you ship St Berry? The fans pick: St Berry >>> any other Rachel ship. That is all. The fans pick: "J: Have you still got my carebear? R: Yes J: *sighs in relief*"
[i]"Definitely the most versatile guest estrela on Glee. While Hair was quite good at playing straight, Hair was even better in its natural state. 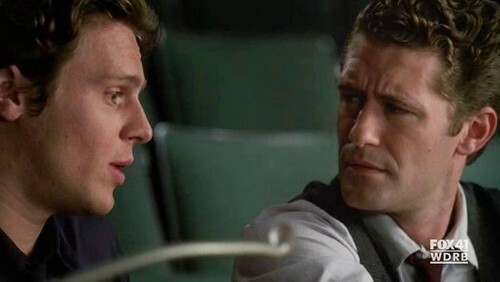 a pop quiz question foi adicionado: S03E21 - Nationals: What's the only vintage thing about Jesse St. James? a pop quiz question foi adicionado: S03E21 - Nationals: When Jesse gets nervous three things happen: he gets mean, he gets really pale and...? a pop quiz question foi adicionado: S03E21 - Nationals: Most people don't realize but Jesse actually lost weight during his Bohemian Rhapsody performance. According to him, how many pounds did he loose? a pop quiz question foi adicionado: TRUE OR FALSE: Jesse St. James once coached Vocal Adrenaline. What class that Jesse took on UCLA he claimed would help on the audition process for Nationals?